On one evening when I just came back from work, I feel so tired, but I still need to cook dinner. I look at husband..he really has problems of eating in small portion. Reminds me to bring him for leptin check later on. ahaha xp. Seriously, why men eat so much @_@ or is it only him? @_@ I requested a big fridge when we move because I dreamed of becoming a domestic goddess who can fill the kitchen with food everywhere. So far, my refrigerator only contains the shelf, and so does my dry food shelf, where I have prepared nice container to stock up biscuits, cookies, buns, etc. All empty. Looks like I married to a food processor or something. ahahaha xp. In regards to this 'problem', I feel obliged to cook something healthy every time. I try. One effort I try to put now is to make sure he gets variety of nutrition in one week. It is such a struggle still, given that when I am home, the energy left is just to cook.haha xp. Still working on it. So on that evening, all I can find in my kitchen was a stack of canned tuna which I carried with me from Hiroshima to Nagoya, now back to Hiroshima @_@ and a whole lot of pasta @_@. I feel the urge to use them right away. Then a bulb of idea popped out, I see Aim's face. She said, "now is the time for you to try my laksa Johor"! And I was like...why not?! Let`s do it! Vietnamese mint (daun kesum)- I don't have this one. 1. Boil a packet of spaghetti. 2. Blend all the ingredients marked "**". 3. Heat oil and saute the blended ingredients. 4. Mix curry powder with water a bit and pour it in the pan. 6. Add in fish flakes and pour coconut cream into the pan. 7. Season with salt accordingly. 9. 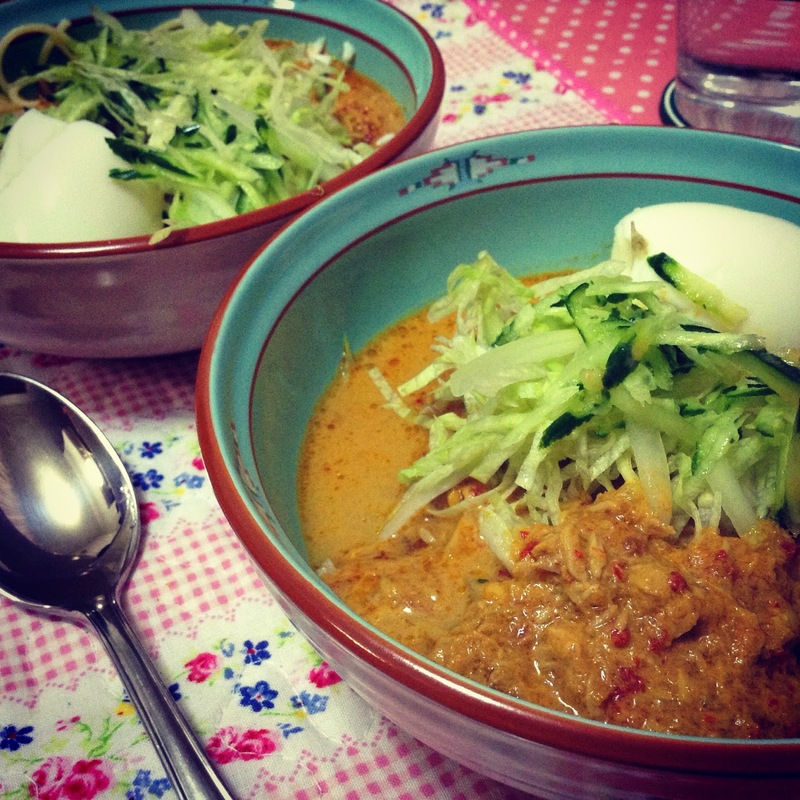 Serve your laksa with sliced onion, taugeh, lettuce, cucmber, sambal belacan and etc. pantang laksa?Gapo?I pun suke sangat2 laksa utara.Sebab ada masam2 gitu kan.Tp husband i tak berapa gemar, so..sobs..